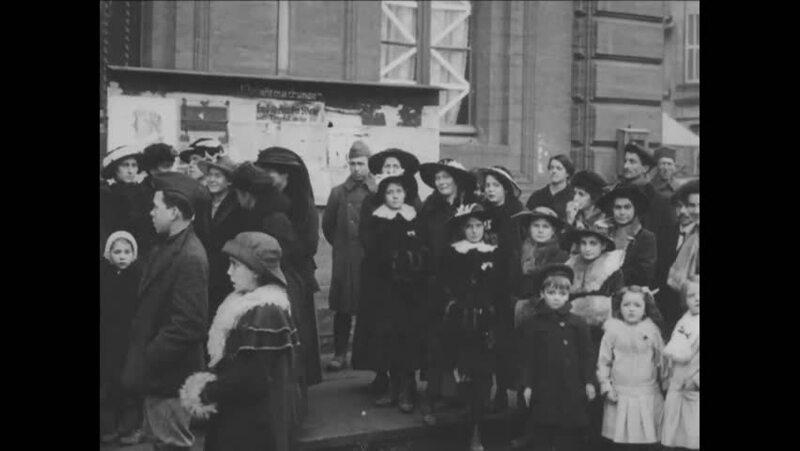 CIRCA 1919 - French men, women, and children hang out in front of the US Army 5th Division headquarters in France. hd01:30CIRCA - 1919 - President Wilson and his wife detrain and they are greeted by Charles M. Schwab, General Helmick and General Butler in Brest, France. hd00:26UNITED STATES: 1940s: People work at desks in office. Teacher talks directly to camera. Lady talks to class. hd00:11UNITED STATES 1950s: Views of rocket launch crew in control booth. hd00:34CIRCA 1944 - The size and character of China's population is described. hd00:41CIRCA 1918 - Flags are dropped from an aircraft and crowds are shown in France in World War 1. 4k00:311960s: Man lights cigarette for woman outside building, Group of men sit around table, talk, smoke cigarettes. Man takes off glasses, sets them on table, talks. Woman behind man takes notes.